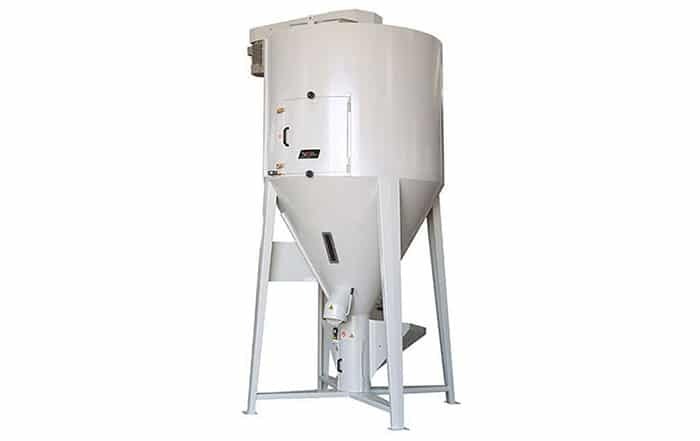 The vertical mixers “MVP” series are designed to mix large quantities of plastic granules. The series has a solid steel structure (externally painted) with 4 supporting legs. A builtin mixing screw is driven by a 4-pole 3-phase motor with V-belt drive. Manual feeding is made through a proper feeding hopper equipped with a protection grid and support for plastic bags. Others components are: protective guards, inspection doors and openings, material outlets. Dimensions range from 500 to 20000 litres. Outlet pipe equipped with a shut-off valve. Bottom discharge opening for an easy cleaning and inspection.